Cover for the ZLX-15 and ZLX-15P speakers. Cover for the ZLX-12 and ZLX-12P speakers. 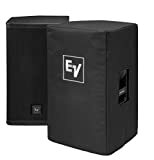 Electro Voice ekx12p Diffuseur amplifié 1500 W 12 "